Flame skimmer recreates a carboniferous-era scene perching on a horsetail, which, like the dragonfly itself, far predates the dinosaurs. A recent walk along the Van Duzen River yielded a couple of interesting things. 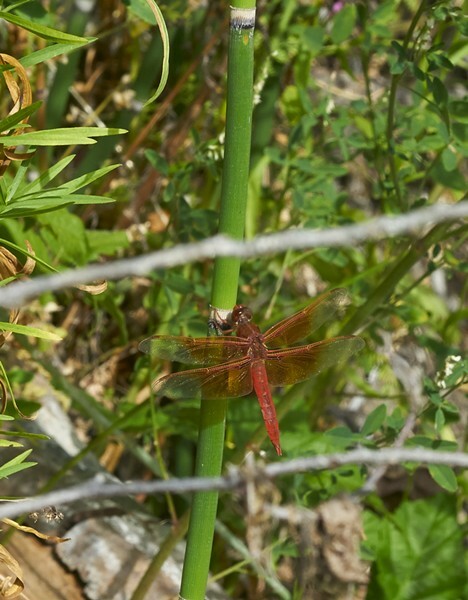 The only dragonfly I saw was a flame skimmer (Libellula saturata). This is the brightest orange dragonfly I know. I rarely see this species; I suspect they travel through my area just stopping to catch a quick bite. A pair of tiny weevils. Is the smaller one "The lesser of two weevils?" I felt something on my hand which at first I thought might be a tick. When I looked it was tiny and gray. Then I thought maybe it was an aphid, although I'd never seen one of that exact color before. It was only after I took a very close look with my little Olympus camera in maximum optical magnification (4X) mode that I realized it was two of the tiniest weevils (family curculionidae) I've ever seen. 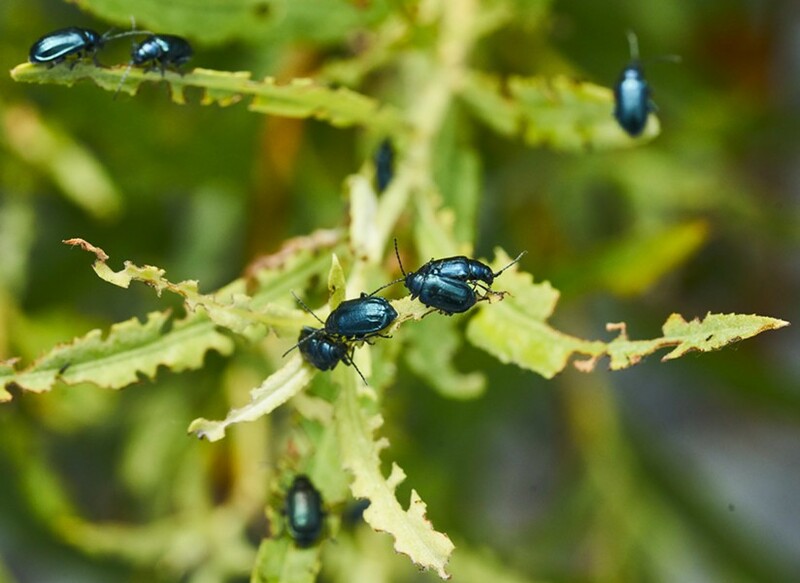 Blue willow beetles can strip entire branches of leaves. There was a lot of damage to some of the little willows that grow right down on the river bar. On close inspection, I found a great many blue willow beetles (Phratora vulgatissima). A tiger beetle unable to run away. 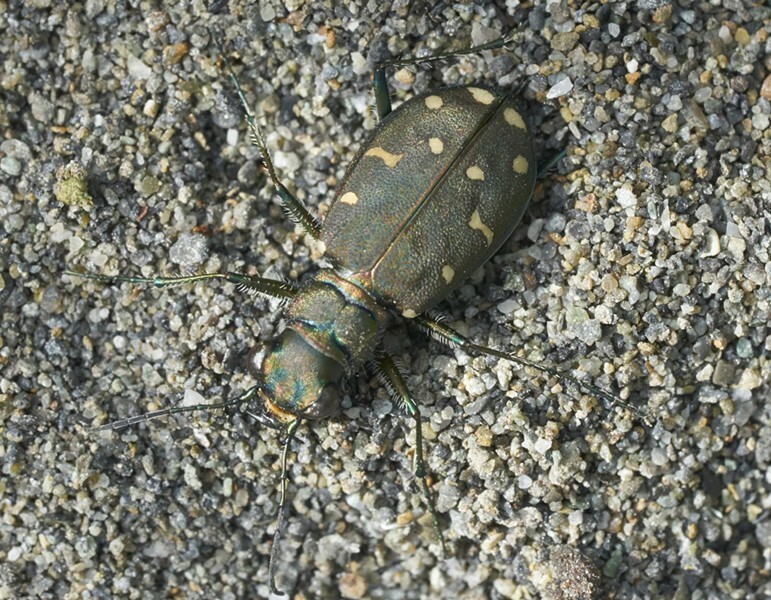 A bit farther upstream I saw the one and only tiger beetle (Cicindela oregona) for the day. While in the past they have been very common, flying ahead of me when I walked along the sandy places, I've seen very few lately. They are usually pretty skittish but this one seemed oblivious to me and my camera. I suspect something was impairing his normal neurological responses.